As we look ahead to the general election later in the spring, Richard Halleron reflects on Simon Coveney’s time as Minister for Agriculture. The history books will, almost certainly, confirm Simon Coveney TD as the most effective agriculture minister that Ireland has ever produced. At an international level he displayed all of his intellect and not insignificant powers of persuasion by managing to get a very tortuous CAP reform deal over the line back in 2013. And, on the home front, he succeeded in putting farming and food at the very heart of Ireland’s economic recovery plan in the post Celtic Tiger era. No one should ever play down his achievements in bringing sense to the Ciolos CAP reform proposals, crystallising them into a package of measures that had practical relevance at farm level and then getting 27 other EU farm ministers to say ‘yes’ – never mind the members of the European parliament. One issue that might come back to haunt him, though is his dogged persistence in promoting the concept of sustainable intensification as a future bulwark for Irish agriculture. His first real opportunity to make this strategy a reality came with the ending of EU dairy quotas almost 12 months ago. The subsequent period has seen the world flooded with milk and dairy markets responding accordingly. Many other EU member states are fully aware of Ireland’s capacity to produce additional milk over the next decade. The targets in place will see national dairy output in the Republic of Ireland increase by 50 per cent during the period 2015 to 2020. Most of this milk will end up as powder, butter or cheese in markets around the world. The question is: can Ireland’s dairy farmers produce all of this extra milk and still get a decent price for it over the coming years? The other matter that could be chalked up as a possible blemish on Coveney’s track record was his failure to get any relief, whatsoever, on the size of the EU dairy super levy bill confronting Ireland at the end of the 2014/2015 milk quota year. Admittedly, he did secure a three year re-payment period, where this matter was concerned. But there is little doubt that the concern felt by other EU members states regarding Ireland’s ability to flood Europe with extra milk may well have coloured their views on how much flexibility they could show the when it came to the principle of settling the super levy issue. While the EU has lots of regulations, compromise on issues of national or community-wide significance is normally the way in which Europe goes about its business. So it was more than significant that the other 27 member states would not give Coveney any succour at all when it came to him requesting a claw back on the super levy payments. But one attribute that cannot be played down is Simon Coveney’s ability to act as an ambassador for Ireland. I was lucky to be part of the press team that accompanied him on his official visit to China in November 2014. From the instant he arrived on a very cold Monday morning in Bejing until leaving the country nine days later, he was on top of his game at all times. It should also be pointed out that he travelled economy class to Beijing – no mixing with the jet set clientele for him. Moreover, he was ‘on stage’ within an hour of his arrival in the country. While in China the Minister spoke at numerous press briefings, product launches and conferences, most times without a reliance on briefing notes. His ability to relate all the positive attributes relating to Ireland’s farming and food is unmatched. 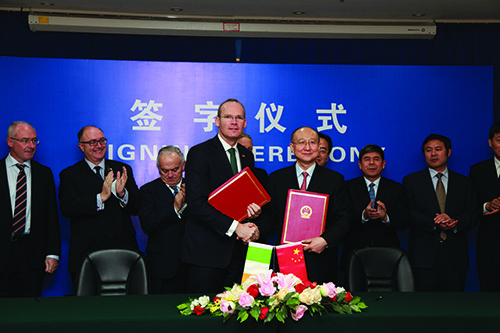 And it’s no coincidence that China opened up its markets to imports of Irish beef shortly after his visit. Coveney is also a pretty decent strategist. From day one of his tenure as farm minister he made it clear that he wanted to secure greater support levels for young farmers. And one has only to look at the out workings of the new CAP deal to gauge how this was achieved. 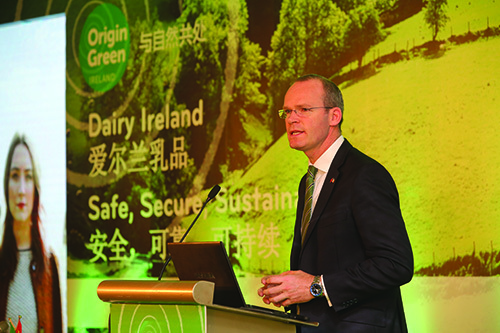 To his credit the Minister has been ahead of the pack in setting out a clear policy for Irish agriculture, in the context of the ongoing global warming debate. Recent times have seen farming – particularly livestock production-take centre stage as the bad guy in the greenhouse gas emissions saga. The theory is as follows: ruminant animals produce methane, one of the most potent greenhouse gases, while the use of nitrogen fertilisers by farmers leads to the creation of nitrous oxide, another extremely active chemical compound in our environment. Coveney’s response to all of this has been to push for the carbon foot printing of every Irish farm business. Quite rightly, he makes the point that we must know the base line from which Irish agriculture, as a whole, is working. And to this end, he has already received significant support from the dairy co-ops and other agri food stakeholder groups. So the challenge now for the industry is to ramp up the efficiency levels achieved by each farming business. If this objective is achieved then Irish agriculture’s overall impact on global warming will fall commensurately. But it will take years for these issues to play out, by which time Simon Coveney will have moved on with his career. One unresolved, yet extremely important issue, involving both ministers is that of cattle losing their identities if moved cross border on to finishing farms. Traditionally, large numbers of cattle born in the Republic of Ireland, are brought north in the autumn for further feeding. According to current EU regulations these animals become ‘nomads’ as soon as they cross the border. As a consequence, northern farmers putting these cattle forward for slaughter can risk price penalties because they cannot ‘officially’ provide the full traceability-related information on these animals. This issue raises its head particularly at those times when finished cattle numbers are plentiful, as may well prove to be the case during the second half of 2016. Some months back Coveney gave RTE radio listeners a very strong hint that he was about to take up a new Cabinet position. As it turned out he was given the defence portfolio by the Taoiseach and asked to remain in place at the helm of agriculture and food, it was all a bit embarrassing at the time. However, there is little doubt that Coveney may well move on to other ministerial challenges, should Fine Gael do the business in the upcoming election. But irrespective of what happens in the future, the Cork man can look back over the last five years with a tremendous degree of personal satisfaction for a job well done!